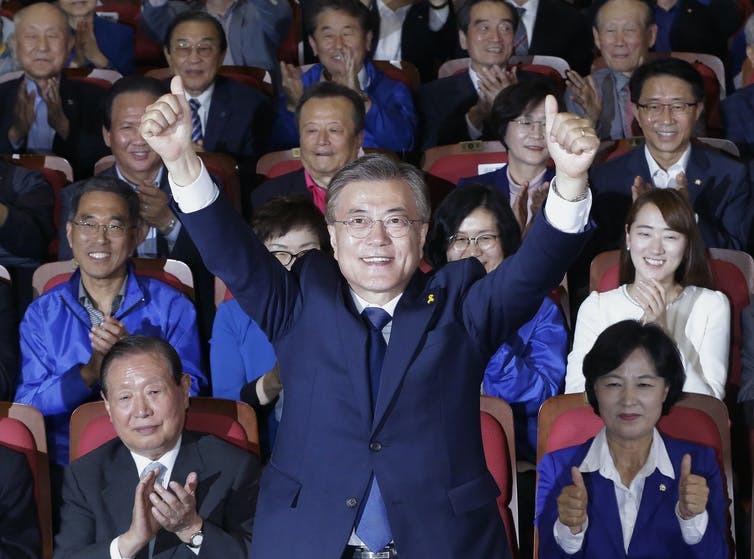 South Korea’s Moon Jae-in victorious on May 9, 2017. Democrat Moon Jae-in is the new president of South Korea. Moon, a former special forces soldier turned human rights lawyer, won a snap election, following months of mass protests that ousted President Park Geun-hye last December. The grace period for Moon will be short. Increasing regional tensions and demonstrations against corruption characterized the presidential race in Asia’s fourth-largest economy. During the campaign, Moon promised to address the systemic problems that led to Park’s impeachment, creating expectations that will define his administration. Here’s what our years of studying Korean migration and security led us to see as the biggest challenges facing Moon. Moon, the son of refugees from North Korea, favors engagement and cooperation with North Korea. On the campaign trail, Moon repeatedly stated he is open to negotiations with North Korea and willing to meet Kim Jong-un. The nuclear issue is now central to inter-Korean relations. If Moon plans a “Sunshine Policy 2.0” – a revival of dialogue and economic aid to North Korea – he’ll need to convince critics that resuming economic cooperation will not fund Kim Jong-un’s nuclear program. Caught between the U.S. and China, Moon will try to pursue an independent foreign policy. Moon needs to manage the Trump administration’s conflicted approach to the region. Trump has voiced the possibility of unilateral action against North Korea, but also suggested that he would be honored to meet Kim Jong-un. Trump stressed the importance of the alliance with South Korea, but also said that South Korea should pay for the anti-missile THAAD system the U.S. has deployed on South Korean soil. And, Trump has suggested that the U.S.-Korea Free Trade Agreement will be renegotiated. Moon also has fences to mend with China, South Korea’s biggest trading partner. China has criticized the deployment of THAAD as an act of aggression aimed at China and retaliated economically by slowing Chinese tourism to South Korea. China accounts for US$131 billion in South Korean export trade, while the number of Chinese tourists quadrupled to 8 million over the last five years, bringing in some $8 billion in duty-free sales alone. Trying to please both sides will be a diplomatic high wire act. The scandal that saw the former president arrested on corruption charges highlighted South Korea’s dependence on huge family-owned businesses, or “chaebol,” such as Samsung. Moon has promised to revive the flagging economy while curbing the chaebols’ power. Even if Moon achieves this mammoth task, he will still have to tackle South Korea’s rising youth unemployment and its overreliance on an export economy that made it vulnerable to economic retaliation. Moon painted himself as the antidote to Park’s corrupt, authoritarian administration. But that scandal is just the tip of the iceberg. The movement that brought millions into the streets of Seoul wants political and institutional reform with greater transparency and more popular participation. Moon must work to rebuilding trust between the people and the political elite. Constitutional reform is needed to end the country’s imperial presidency and return power to the National Assembly. This is a key step to bring people back into the political process and give them an effective voice. The frustration many South Koreans feel with collusion and graft pushed Moon to victory. The question is: Can he distinguish himself from a decade of conservative, pro-big business presidents without being labeled a North Korean sympathizer? Or will he end up yet another in a growing list of disgraced South Korean leaders?